For years I lived in fear of sewing stretchy fabric. 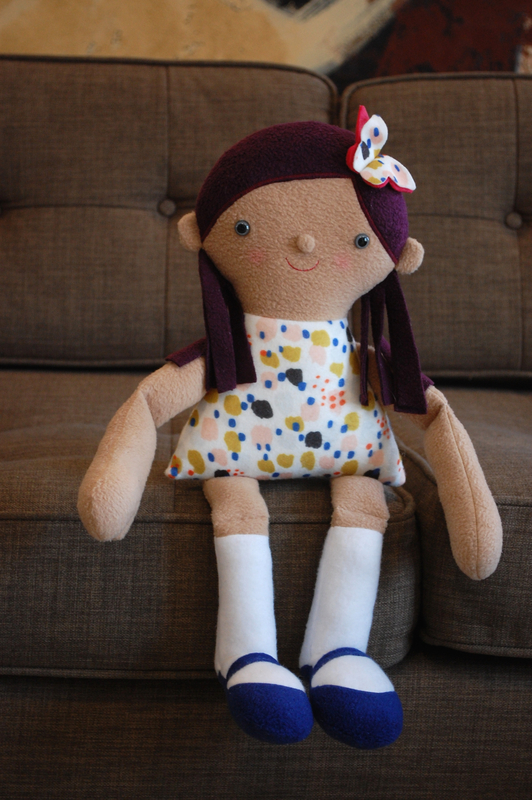 I made all of my dolls and toys from wovens, or from faux fur with a woven backing. Then, about four years ago, I started sewing with fleece and my fear evaporated. When it comes to softies fleece is a dream to sew with! It’s thickness helps hide any tiny inaccuracies in your sewing and the finished toy is soft and cuddly and machine washable. I’ve developed more than two dozen patterns that use fleece since then and my fleece stash has grown enormously over the past few years (four drawers full!). I’ve shopped for fleece at Jo-Ann’s and our locally own fabric store, Fabric Place Basement, and I’ve bought fleece online from Fabric.com. It’s easy to find good solids, but finding prints appropriate for doll-making is really frustrating because the scale is so large and frankly the prints are really ugly. I think most fleece prints are intended for making sports blankets? But thanks to the wonder of digital printing all of that is about to change. 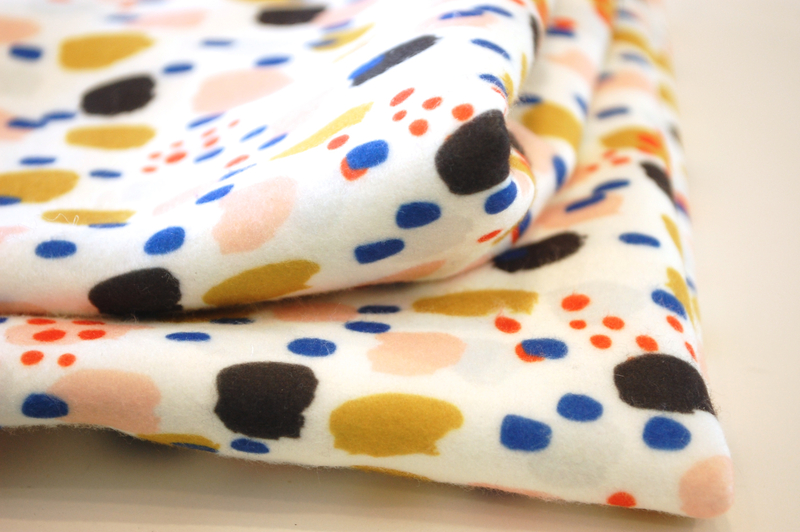 Today, Spoonflower announced its new substrate: fleece! 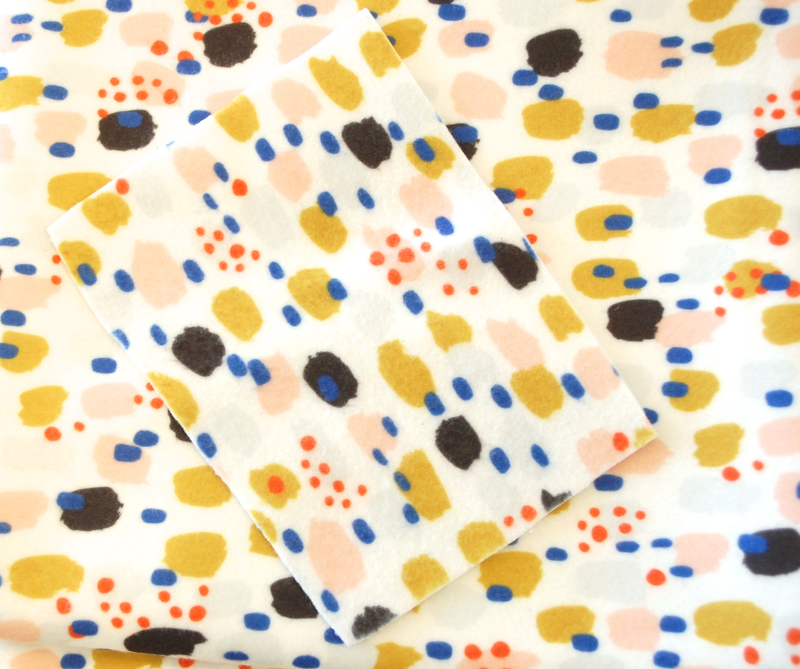 According to Spoonflower’s Senior Marketing Associate, Theresa Rizzuto, fleece is their most requested fabric and I’m so thrilled that it’s finally here. I was able to place an order for a yard in advance of the launch and it came last week. My main concern was that the fabric would be so plush that a small-scale print would be lost in the fuzz. Fortunately this fleece is low loft and the fuzz issue is non-existent, even after washing. Above you can see my yard of fleece with a swatch I cut off and threw in the washing machine and dryer with a load of laundry. No change in fuzziness and no fading, either. I made my Emma doll with this pretty, modern Spoonflower fleece designed by Nadia Hassan as her dress and I’m so happy with this doll! The ability to actually find fleece in prints I like is just mind-blowing. This is a big day! Fleece at Spoonflower is 25% off from 10:00 am EST today through Friday, April 8 at 11:00 am, so now’s a good time to give it a try. 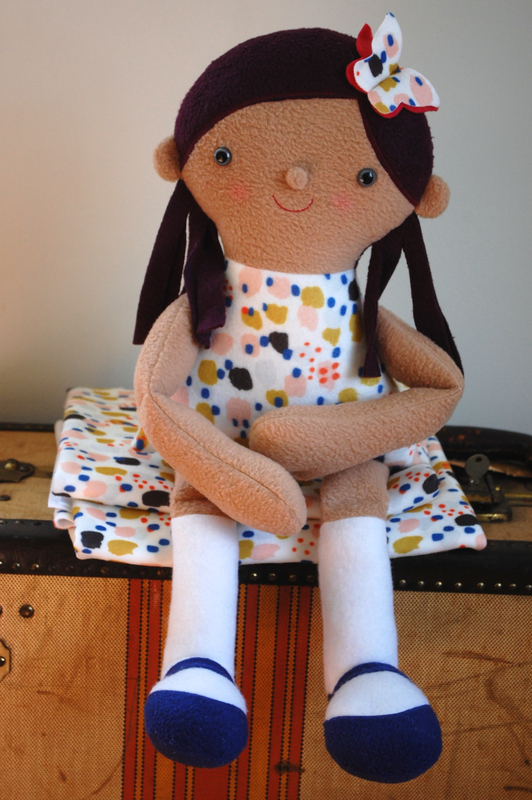 And to celebrate I’ve put my Emma doll pattern on sale during the same time. Hooray for custom digitally printed fleece! Hi Lynn, Thank you so much. The clothes on this doll are all part of her body so they aren’t removable. I haven’t created any removable clothes for her, at least not yet. It looks so great! Nice thing about Spoonflower is you can actually print your patterns right on Spoonflower fabric with the colors and patterns (yours or licence from a designer to use) that you want and save some of the cutting and sewing. Better yet maybe some could even be Sprout patterns were people add their choice of patterns. Though that might be more expensive. It is probably still better the way you are doing it with different fabrics since Spoonflower is pricey. Faces could be printed with details already on them and save the hand coloring step. I love your doll and will order one. I was excited to see Spoonflower offer Fleece fabric for printing. I am glad you added how the fabric looked after washing. This information was good to know. I have a question. I want to make printed blankets. I know the printing is on the surface but how does the printed fabric look on the back? Does the print go through the entire fabric so that you can see it on the back or just on the surface with a little bleeding of the image to the back of the fabric? Thank you in advance for your help and I look forward to receiving your blog on Wednesdays. Hi Danni, Great question! The back is white. Very cute! I’m glad they came out with fleece. Would you say that the black printed as a true black? I’ve ordered some fabrics from Spoonflower before, and some printed blacker than others. On some, the black came out more like charcoal gray. Their customer service was great though, and the fabrics were a nice quality. I felt the black part of the print was a true black. I just received an order of “fleece” from spoonflower and am SO disappointed!! The fabric weight is that of heavy flannel, NOT the napped fleece I am used to buying. Please, please, please let everyone you know that this fabric – while nice – is different from the fleece we are used to using to make cuddly throws and blankets!! Thanks and Merry Christmas to all.